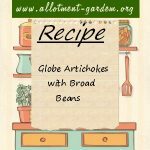 Recipe for Globe Artichokes with Broad Beans. A delicious main course vegetarian meal. Serves 4. 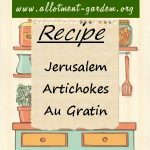 Preparing the artichokes is fiddly but worth it. Recipe for Jerusalem Artichoke Pie. Best served hot straight out of the oven with a green salad. Serves 4. Recipe for Jerusalem Artichokes with Tomatoes. 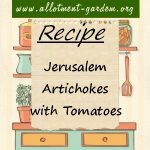 An easy artichoke and tomato hob recipe to accompany a variety of main courses. Serves 4. 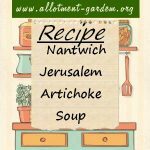 When I lived in Nantwich I was surprised to discover this delightful Jerusalem Artichoke Soup Recipe. Tasty and nourishing. Can't be beaten.